At Mens Tungsten Online we understand your concerns when ordering your tungsten wedding ring online and we strive to make the process as easy and hassle-free as possible for our customers. If you have any questions before ordering please contact us and we will answer your questions to the best of our abilities. If there is a certain date you need your ring by please include that information with your order so that we can accommodate your order. If you make an order and haven't received it please contact us at least the day before you need it. We have no way to send a ring same day. Orders can be returned for a refund within the first 45 days for a full refund. No questions asked! We do not have any extra charges and there are no hidden fees! (PLEASE NOTE THAT THIS DOES NOT COVER OUR CUSTOM RINGS INLAYED WITH WOOD, METEORITE, ANTLER, MOKUME OR BONE). See our WARRANTY page for more details. Include all items to the address below. Refunds are processed within 48 hours of receiving your return, and may take up to 72 hours to be reflected on your credit card. 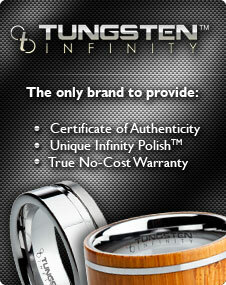 * Mens Tungsten Online is not responsible for loss or damage of return shipments. Please insure your return packages. *Please note that all custom rings (found in our custom ring section or any ring that is inlayed with wood, meteorite, cobaltium, mokume, dinosaur bone, antler or coin rings) do not come with a 45 day moneyback guarantee, lifetime replacement warranty nor does it come with a lifetime sizing warranty. If any defect is found in the ring, it may be sent back to us for perform warranty work on the ring. The ring may be returned within the first 45 days for quality defects only and may not be returned for money back if it has been laser engraved.